The Audio-Technica ATH-S200BTs are budget-friendly, big-sounding Bluetooth headphones that do a lot for their price. Their plastic looks may not be for all but the sound they produce, for the price you pay, is impressive. The Bluetooth headphone space may have some audiophile’s baulking at the thought of listening to music without a cable, but there have been great strides in the technology and, in return, the sound. Technological advancements usually mean price rises but not so, here - the Audio-Technica ATH-S200BTs offer up quality sound for a modest price. But it’s not just the audio that’s the talking point - the battery inside will mean that worrying about charging your headphones will be the last thing on your mind. Given the modest price, Audio-Technica has created a pair of headphones that are functional, rather than stylish, in their design. The only metal you will find here is in the head band extender. Everything else is plastic; that’s by no means a bad thing, though, as the ATH-S200BT’s aren’t cheap feeling but nice and solid. There’s little movement when they are on the head, at least nothing that was at the detriment of the sound. On each of the earcups is the Audio-Technica logo, on these earcups are soft earpads - they are not memory foam but comfortable nonetheless. These cans are 'on ear' so they rest but don’t envelop the ear. Each earcup has enough movement to suit most heads and the band has a stretch of soft material on the top. All of the buttons and inputs are on the bottom of the left earcup. These are: an on/off switch, Bluetooth notification light, volume, and a pause button that also acts as a call button. There is also the charging slot, which is micro USB. Let’s get the biggest niggle out of the way first: these headphones are a bit too tight on the head. On-ear headphones are always a Goldilocks situation - some are too loose, some too tight. It’s rare that you get them just right. These ones are on the tight side, with the addition of being really light at 190g, and that means after long listens they did start to pinch our ears. Again, this isn’t uncommon with on-ears but is worth noting. A re-adjustment and few minutes’ ear rest and all was good. 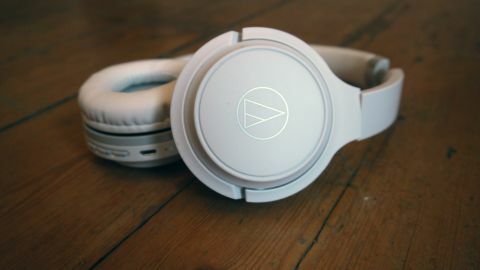 We started with that niggle as there isn’t too much else that can be criticised when it comes to these headphones. The sound is as solid as the ATH-S200BT’s build quality. Taking into consideration the price of these headphones, the sound really is impressive. There isn’t quite the depth we would have liked, but there is a clarity there that’s usually only heard in £100/$100 plus headphones and here you get it for nearly half the price. We had no issue with loudness, although Bluetooth headphones are always a little on the quiet side, and would have liked a little more richness in the midtones but the bass was deep and cut through most of the sound. The brooding timbre of Damien Jurado sounded lovely through the headphones, his song Allocate’s fragile bass taking centre stage. The synths of Weezer’s take on Toto’s Africa were given a nice bit of space, while the hymn-like Yikes by Kanye West stood strong through our listening tests. Yes, there could have been a touch more detail across the board - and the lack of aptX is unfortunate - but we have to keep coming back to the price tag. It’s rare you get this quality of sound and design at this price. And then there’s the battery life. We certainly haven’t tested a pair of headphones at this price with 40 hours on the clock before - it’s a fantastic amount of battery life that means you can go a week or so and not worry about charging them. When you do, it takes around four hours and is done through micro USB. The ATH-S200BT’s are a well-built, great-sounding, long-lasting pair of headphones. Their features constantly outweigh their modest price and we can’t get enough of that 40-hour battery life. Although the earcups are comfortable, they are a little too tight on the head and this can cause pinching. But this is a small niggle against what are a great pair of headphones.